Okay, I am still alive, I promise, but I just either didn't have anything to blog about and didn't have time! My life is too busy and it drives me insane, not to mention I get sucked into spending more time on Facebook than anything else! So, I have three jobs - my main one and two part time jobs (no, I don't work at "that" place anymore!). Two of the jobs I do in my own time, but I am finding lately that I have very little of that. My mom is driving me crazy telling me that I shouldn't work so hard, but when you have bills to pay, you have no choice. We can't all be retired for the last 20 years mother!!! 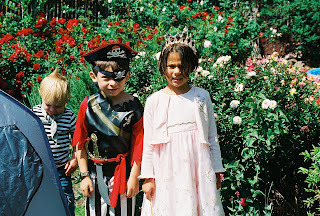 Ned turned 5 in June with a fabulous Pirates & Princesses party and all the kids came dressed up. 24 children in total! The parents had a great time, mainly because I served martinis, and complained that this was the best party they had been to and I had set the bar too high! Ned has also turned into a teenager overnight because he has a rotten attitude sometimes and can be quite a handful. Although he has given me permission to get married and have a baby brother for him, so I guess I am on the look out for a suitor! Speaking of which, I have grown a pair and asked two guys out on coffee dates in recent months. It hasn't gone anywhere, but it has just been nice to go out to coffee with someone. Now I just need to find the right one! Gotta make that baby brother for Ned before the eggs get rotten! I will try to come back more often, but I am making no promises as I am just a crap blogger. I am an even crappier blog reader, so don't hold it against me!